In 1997 I compiled the Sadhana of Bodhisattva Earth Treasure in Chinese. In 1998, 3,000 copies of its first edition were printed for free distribution. It has since become out of print. In 2002 I made minor corrections and added two poems as appendices to form the second edition. This English translation is based on the second edition that is posted at Yogi Chen's Homepage but has not been printed yet. In 2002 I translated the Sutra of Earth Treasure from Chinese into English. In the same year I also translated into English two Chinese works of mine that are related to the study of this Sutra. They are the first two appendices to this Sadhana. On the very last day of 2002 I resumed the translation of this Sadhana that was postponed by the works mentioned above. Among Chinese Buddhists there is a tradition of practitioners who devote themselves mainly to the worship of Bodhisattva Earth Treasure and to the practice of chanting his holy epithets and Sutra. May the presence of this Sadhana similarly foster such a tradition among Buddhists all over the world! Usually the main practices for Bodhisattva Earth Treasure's followers are regular recitation of his Sutra, constant repetition of his epithet, doing veneration and making offerings to his images. In order to further benefit such practitioners I first studied the Sutra thoroughly to grasp the key principles and then wrote the essay on "Essential Teachings of the Sutra of Earth Treasure." As a by-product I wrote along the process of my in-depth study a short summary called "Outline of Practices from the Sutra of Earth Treasure." They form the first two appendices to this Sadhana so as to help practitioners of this Sadhana to understand the essence of the Sutra better. Based on my understanding as gained from writing these two works I compiled this Sadhana for daily practice. At the beginning and near the end there are practices of returning to Blank Essence included. It is infused with the Dharmadhatu perspective that is limitless in time and space. Thus, the Dharmadhatu perspective that runs through the Sutra would become prominent in daily practices, and the practitioners would thereby gain strength in attaining realization of no-grasping soon. This Sadhana is compiled for concentrated practice in the Dharma Gate of Bodhisattva Earth Treasure. This kind of concentrated practices has the advantage of using limited time and energy to achieve in-depth results through developing the habit of maintaining regular daily sessions. Therefore, it is suitable for Buddhists who follow an ordinary secular life to adopt this Sadhana. Practitioners of such practices should understand that the concentration does not imply an exclusive mentality to other practices. Rather, it signifies that through mastery of one path one may comprehend the essence that is common to all paths. In this Sadhana Refuge and Bodhicitta have been tailored to become directly linked to Bodhisattva Earth Treasure. "Earth Treasure Lineage teachers" refers to the lineage of practitioners, that specialize in this Bodhisattvas's worship and practices, that the practitioner is learning from. In this Sadhana there are twice returning to Blank Essence. The first time is right after Refuge and Bodhicitta, so as to evaporate the practitioner's attachment to beings and things in the world. Furthermore, it enables the practitioner to conduct the remaining sections of the Sadhana in the limitless time and space of the whole Dharmadhatu, and thereby help develop the openness that encompasses all in the Dharmadhatu as one. In this ritual I choose to use the notion of "original purity" to express Blank Essence. The traditional mantra for returning to Blank Essence is also replaced by a statement that expresses the significance of Blank Essence. These innovations are employed to help practitioners understand Blank Essence deeper through looking at and approaching it from another angle. The second returning to Blank Essence is after the dedication of merits, so as to clean up the practitioner's attachment to Dharma-related matters such as states of meditation, inspirational experiences, merits, supernatural powers, etc. Furthermore, it would help the practitioner, after completion of the session, to carry out the great vows and deeds of Bodhisattva Earth Treasure in daily activities from a completely purified state of mind. The stanzas of offering and praise are composed in accordance with the main points taught in the Sutra. In this way the practitioner would recall the key elements of the teachings through recitation of these stanzas. In the stanza of offering, not only items of sustenance and material offerings are mentioned, but also all kinds of Dharma activities. This is because nothing can please Buddhas more than minds and deeds that are in accordance with the teachings. While reciting the stanzas one may use vajra, bell, drum, and other musical Dharma instruments. Prostration can be the usual kneel-and-bow type or the full-length type of tantric Buddhism. Recitation of the whole Sutra can also be divided into three parts so that the practitioner will read one of the three volumes in the Sutra in one session and finish one round in three sessions. Repetition of the holy epithet should be maintained in daily life whenever possible. 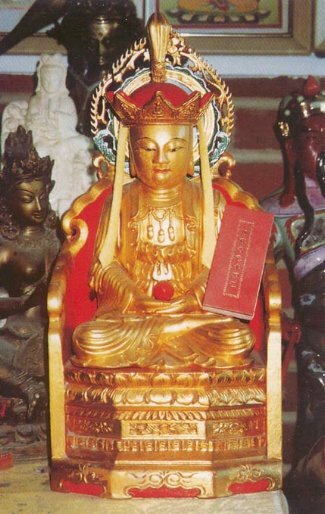 The three Chinese works related to the Dharma Gate of Bodhisattva Earth Treasure were all completed in first draft on July 22, 1997. That night before going to bed I prayed to Bodhisattva Earth Treasure for his compassionate sign of approval. Next morning in a dream I obtained a six-string stringed instrument and gave it to a fishing man. Someone threw a white ball, the size of a baseball, toward me from far, medium and short distances. Each of the three times I safely caught the ball with one hand. The very last time I grasped the ball tightly and would not let it go. The white ball transformed into some kind of plastic material. Then I saw a new car of recent model that was shining yellow and beautiful. The stringed instrument with six strings represents a tool for practicing the harmonization of the six Paramitas so as to convert beings in the six realms. In dreams fish represent sentient beings, and hence a fishing man represents practitioners who attempt to rescue beings from suffering. Giving such a person the stringed instrument means to provide means for salvation activities. The white ball represents pure and complete circulation, thrown from three distances means the three works have different degrees of intimacy with practitioners. (The article on Essential Teachings leans toward theory, the one on Outline of Practices leans toward practices in general, only the Sadhana one unifies theory and practice into regular daily sessions.) Holding onto the most intimate Sadhana and practicing accordingly in daily life, one would become moldable and could then be transformed into a Dharma instrument. The ball was safely caught; that means a complete grasping of the essential contents. The direction suitable to Bodhisattva Earth Treasure is South, of the Earth element, and of the color yellow; therefore, the yellow new car represents this newly modeled Sadhana could help practitioners of this Dharma Gate to make smooth and swift progress on the path. In the night of July 23, 1997 in a dream I walked into an area where the earth appeared to be mineral. On the ground there was a university. There are many spots on the ground where white liquids were emerging. This dream is clearly related to learning the great path of Earth Treasure's compassionate vows. The emergence of white nectars from the ground is a sign of revealing secret essences. The dreams mentioned above are clear signs of approval. I carefully record them here as a token of my gratitude to Bodhisattva Earth Treasure's grace in granting them. May such records increase the faith of all those who come across them in the practices of the Dharma Gate of Earth Treasure. In addition, may such records provide references for future practitioners as they proceed on the path. I take refuge in Great Bodhisattva Earth Treasure. I take refuge in the Sutra of Earth Treasure. I take refuge in Earth Treasure Lineage teachers. May all sentient beings possess completely happiness and causes of happiness! May all sentient beings be forever free from suffering and causes of suffering! May all sentient beings never separate from vows and deeds of Earth Treasure! May all sentient beings soon attain the realization of Bodhisattva Earth Treasure! Visualize that all beings and things are originally without distinctions made by consciousness. They merge into limitless oneness and appear as cloudless blue space. From blue space of Blank Essence suddenly emerges Great Bodhisattva Earth Treasure who is surrounded by countlessly many duplicate bodies. Above them are all Buddhas of the ten directions and three times with Buddha Sakyamuni at their center. Below them are all Dharma protectors such as the Heavenly Kings of the four cardinal directions, Emperor Yan Luo and his associate Ghost Kings, and the Earth God Sturdy. The holy assemble as described above presides in the space above in front of the practitioner. In addition, the practitioner visualizes that, to his right is father and his left mother, in his front relatives, friends and karmic creditors, and behind him all beings in the six realms (following in the order of hell beings, hungry ghosts, animals, humans, asuras, and heavenly beings), and that all are facing the holy beings. All practices conducted below should be visualized as being performed by all beings simultaneously, and that all holy beings are pleased by the activities so that they all emit lights and sprinkle nectars to bestow blessings. Before starting to practice this ritual one should have lighted candles, burned incense, offered clean water, fresh flowers, fresh fruits, etc. At this juncture one recites the stanza given below, and simultaneously visualizes that all the superb items of offering and means of sustenance in the whole Dharmadhatu are boundlessly offered to each and every one of the holy beings. Furthermore, the holy beings are all very pleased with enjoying the offerings, and they return favors by emitting lights and sprinkling nectars on all sentient beings to bestow blessings. Flowers and incenses are offered to express ardent reverence. Banners and pennants are offered to enhance superb grandeur. Embroidered satin clothing are offered to enhance merciful countenance. Treasures and jewelry for leisure delight. Singing, praising, dancing and playing music in order to please. Lighting lamps and spraying perfumes to propagate teachings far and wide. The practitioner may choose to adopt one of the two practices listed below as the regular one, or to practice them alternately from session to session. Repeat the epithet "Namo Bodhisattva Earth Treasure" once while making one prostration; do prostration thus thirty times. For each given epithet, make one prostration while repeating the epithet once. In case of the epithet of Bodhisattva Earth Treasure, repeat thus three times. Will Earth Treasure wish for Buddhahood. And enjoy fortunate results beyond expectation. He would never forsake any sinful being. His duplicate body would appear to help. Earth Treasure undertakes the mission without fail. The practitioner may choose to recite in one session either the whole Sutra or one of the three volumes, and rotate in the sequence of upper, middle and lower volumes. Devoutly and reverently practice for the enlightenment of all beings. May this endeavor move Bodhisattva Earth Treasure to grant blessings! And diligently advance on the path to achieve complete enlightenment soon! Visualize that all holy beings in the space in front transform into lights of blue, white, yellow, red or green colors and merge into Bodhisattva Earth Treasure. All sentient beings transform into white lights and merge into the practitioner. Then Bodhisattva Earth Treasure transforms into yellow light and merges into the practitioner. Then the practitioner transforms into blue light and returns to the Blank Essence. Abide in the cloudless blue space that resulted from all returning to Blank Essence. From this blue space of Blank Essence suddenly appears, like a fish jumping out of the surface of water, the phenomena world as known by our senses. This phenomena world appears outwardly to be no different from before the practice session; however, its content has been purified through the Blank Essence visualization. The practitioner no longer holds it as existing absolutely on its own, and would not become attached to appearances. Through the blessing of Bodhisattva Earth Treasure the practitioner would conduct activities, in accordance with the great vows and deeds of the Bodhisattva, in daily life as occasions arise. 1. May virtuous gurus remain with us and those departed return soon! 2. May perverse views and violence soon become extinct and Dharma spread without hindrance! 3. May all beings proceed diligently on the path and achieve Buddhahood before death! 4. May all beings develop Great Compassion and never regress until they reach perfect Buddhahood! 5. May all beings develop Great Wisdom and never regress until they reach perfect Buddhahood! and preparing the camera-ready copy for printing. Thanks to Buddhist friends who helped produce the original version. Donation toward printing and free distribution is welcome.